How Will You Spend Your Saturday Instead Of Watching Raiders-Texans? The nice thing about the NFL is that it doesn’t worry about hurting feelings with its TV scheduling. It’ll flex terrible teams out of primetime and not even hide the reason why. So for wild card weekend, when there’s almost always one obvious stinker, you merely need to ignore the early game on Saturday, where it’s scheduled precisely to be ignored. Oh look, the early Saturday game is Raiders-Texans. It’s a home game for Houston, the AFC South champs because someone had to be. The Texans went 5-1 within the division and 4-6 without, and finished with a negative-49 point differential, worse than every other team that made the playoffs and 14 that didn’t. The Texans are talking about redeeming themselves after last year’s 30-0 crapfest playoff loss, and while another shutout seems improbable—though Houston did tie for the fourth-fewest points scored in the NFL this season—they are still a mess at quarterback. Tom Savage started in yesterday’s loss to Tennessee after taking over for Brock Osweiler the week before, but he looked every bit as ineffective then suffered a concussion and had to leave the game. Osweiler didn’t exactly distinguish himself in the remainder of Houston’s 24-17 loss. So who gets the call next week? “I want to start,” Osweiler said. Savage was in the concussion protocol and didn’t talk to reporters. Coach Bill O’Brien said the decision hasn’t yet been made, but he did say that it won’t necessarily be dependent on Savage’s health. So Brock’s a good bet to start. Whoever it is, he’ll be facing the Raiders, who have huge quarterback problems of their own. Derek Carr’s season-ending injury probably doomed Oakland’s chances of going deep in the postseason, but the Raiders had very high hopes for Matt McGloin. So, of course McGloin left yesterday’s game in the second quarter with a shoulder injury. Connor Cook came on in relief, but neither of them look particularly capable. McGloin and Cook combined for just 171 passing yards, and Raiders totaled only 221 yards, against a Broncos D that was missing four starters. Combined over the last two weeks, McGloin and Cook are 22-for-35 for 200 yards with one touchdown and two turnovers, both Cook’s. This is a far cry from the Raiders team that trailed only the Patriots in points per game in the AFC, and seemed destined for a first-round bye. Instead they settle for a wild card and hit the road. So who’s it going to be against a formidable Houston pass rush? Head coach Jack Del Rio said it’s too early to know whether McGloin will be healthy enough to play, but he also said that McGloin wouldn’t automatically get the start even if he’s good to go. 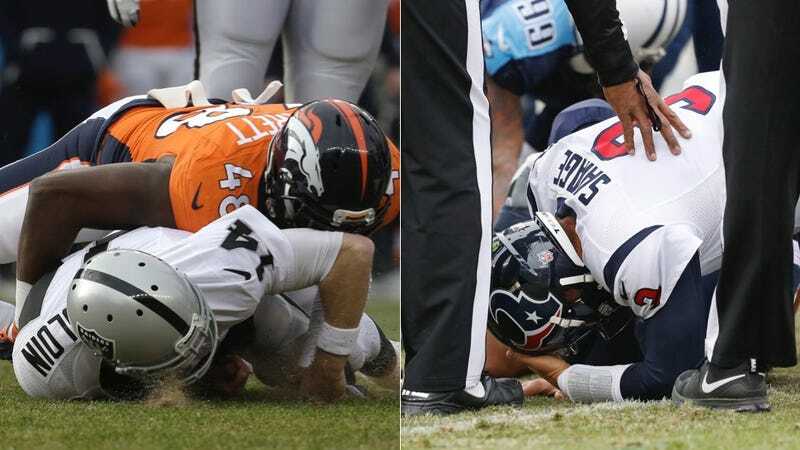 None of all this is to say that next week’s game won’t be fun—often the closest and wildest NFL games are those played between two severely flawed teams. It’s just that in the grand scheme of things this postseason, neither of these teams matter, and you should feel free to go out and enjoy your Saturday afternoon.